You can find both issuu and mygazines in the books category. If you want some other site to be added please leave a link in the comments. Whatever little I've seen so far bing could actually change the way we search. I doubt it will be another Cuil. Though personally I don't mind Cuil. Its another interesting approach to search. I use it every once in a while. I will try and add bing the day it is launched. 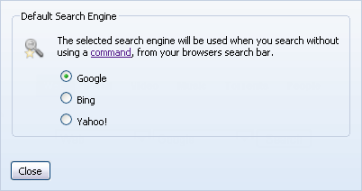 It just might be reason enough to change the default search engine from Google to Bing. If nothing else I might have to think of adding a feature to change the default search engine soon enough. But I guess I will have to wait and see how things work out. 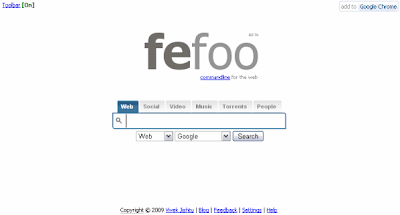 Fefoo has been designed in a way that it should never feel slow. Firstly its cached on your system so it gets rid of the time required to fetch the data from the server. The network time is the one which makes most web applications slow. This was the first thing I had to take care when I started with fefoo. In most cases fefoo is fast enough to send you to the destination site in a fraction of a second. Thats just one part of the story. There are more than 200+ search engines that are available to you on fefoo, but not every one of them has a server farm all across the world. And that is where the perception part comes into the picture. 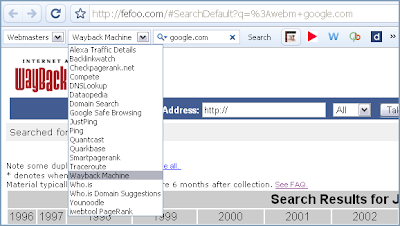 When you use the semicolon command to search, fefoo is supposed to directly take you to the search engine without displaying the toolbar on top. In most cases if the search engine has a server farm near you, one would not notice much difference in speed. But in case the server being contacted is slow or down you would end up seeing the fefoo toolbar for a good 2-3 seconds and in a way it would seem like fefoo is slowing down things. Now when you search from the search bar on your browser using the semicolon command. It hides the toolbar and changes the title to the search engine being redirected. 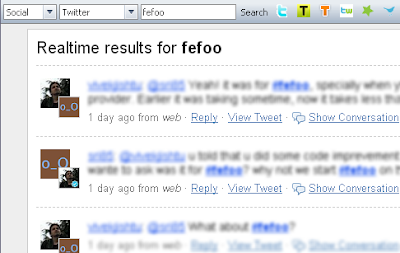 This might seem like a very small little change but it changes the perception that fefoo is slow. The moment you see the title change fefoo has already redirected to the search engine and whatever delay you see is because of the search engine you are searching on. This is one big question on my mind for the last two weeks. Should the toolbar be [On] by default or should it be [Off]. It is one major thing I need to decide before the launch. Still not decided when the official launch is going to be. Still have a few things I need to take care of before I can say that I am finished with things. Have added quite a few search engines to search for recipes. I don't cook much but I guess there are people who use these search engines, I've added 15 search engines for cooking recipes. Also have been moving around the UI elements here and there, trying to get the defaults right. If the defaults are not right no one will use it. It should be simple enough to understand without ever looking at the help. I still have a few issues with the commands. I can use them and they are probably the only reason why I am so hung up about fefoo. The main problem with commands is that they are not discoverable. A user needs to learn it and asking someone to take a minute to learn it seems like a lot. I still have to get the videos done. I am also pushing a new build with more bug fixes and a few new search engines. There is a feedback link on the bottom of the homepage. If you have any issues or bugs or feature request please don't hesitate to give in your comments.